THE SECRET TO PERFECT LIPS! Indelible Line Lipliner by Blue Water Naturals! Waterproof, lip-lining bliss! 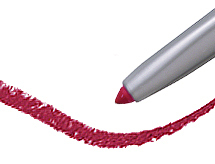 This lipliner has an anti-oxidant enriched formula and provides a precision line. No feathering, fading, or bleeding and no sharpening is required. The attached lip brush is ideal for applying and blending.